Jeu de direction stronglight S5 super competition. pour vélo de course des années 1975 1980. Bottom brackets : 36 x 24F Italian. Parfait état. Super VITUS 971. Stronglight Competition. Gitane Cycles. Cadre vélo. Il vous faudra peut-être nettoyer, régler la ou les pièces que vous m'achetez. Les PHOTOS font partie du descriptif. [ USED ] Bottom bracket Stronglight Competition. Bottom brackets : 35 x 1 French. NIB Stronglight V4 Competition headset. Thread: French 25x1. NIB STRONGLIGHT P3 COMPETITION HEADSET. Years: Early 1950’s. Upper bearing size: 5/32’ needed. Stronglight Competition Headset. Cone 27,0 mm. Stronglight Competition ". 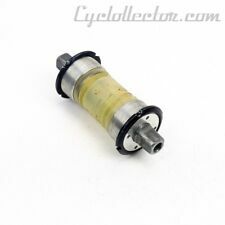 Mod 65" 118mm Bottom Bracket Spindle. Hollow,ISO taper, spindle stamped with logo & spindle length. Races are smooth are bolt threads are clean. FOLLOW UP-. 24 hour Grace Period. Zustand: Gebraucht. Für das edle Rennrad der 60er Jahre. Threading: 36x24F ITA. Weight: 197g. Spindle Length: 118,5 mm. 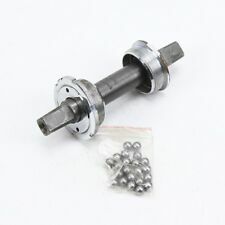 Titanium Axle. Threading: 36x24F ITA. >> kommt vorbei und schaut es euch an. can be used on both sides. The steel bearings and races are identical to the A9. The crown race is aluminum. Everything else is black Nylon. The top locknut and upper race are one piece as shown. Stronglight 55 Competition Cottered Crank arm set. We're the online bike parts dealer for rare components and spare parts for your restoration and repair. English thread. A nice strong piece in great condition. It is not stamped as to which thread they are. English thread will accept both threads, while French thread will not accept English thread. English thread pedals do bind up in this so I am ASSUMING FRENCH THREAD. English thread. A nice strong piece in great condition. They certainly will be outside of any manufacturer’s warranty. Local pick up is also available.